I did it!!! You may have noticed a different look to my site… It’s because I’ve finally gone self-hosted! I switched from the WordPress.com’s personal plan to WordPress-capable hosting with Siteground, and I’m very happy with my decision. I debated making the switch for a long time, and after spending so much time researching hosts, reading posts about going self-hosted, and talking to people about it, I finally read this post from one of my favorite bloggers, and decided to just do it, and start taking my blog a little more seriously. I’m blogging because I love it, but I do want to keep improving and being the best I can be. That being said, if I want readers, brands, and other influencers to take me seriously, I have to take me seriously. There are so many reasons to go self-hosted! I wanted to go self-hosted so I have fully customizable design and access to advanced themes and plugins. I also wanted more freedom with my site and an overall more professional look. 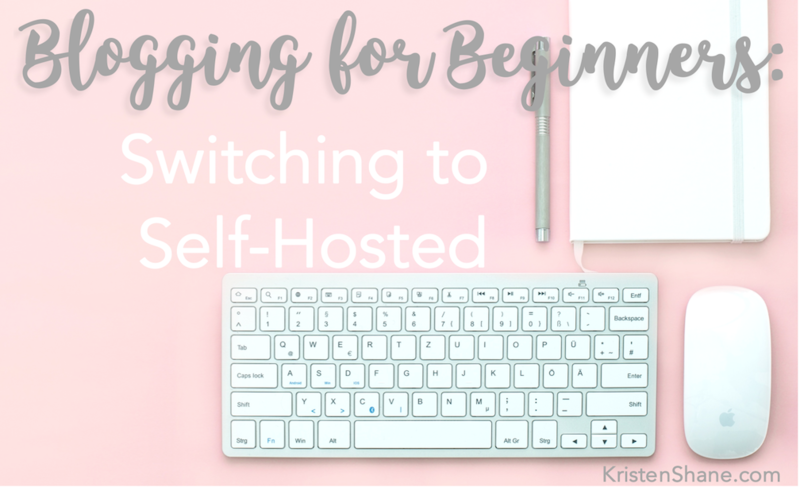 After reading so much into the benefits of having a self-hosted blog, I decided that I was ready to take that next step, even if it means going through all the “hassle” of actually making the switch. In general, you have so much more freedom as a self-hosted site compared to a blog through plans like those WordPress.com offers. There’s nothing wrong with those plans, it’s really just about what you’re looking for, and what your goals for your site are. And with self-hosted, you still have the ability to install WordPress through the JetPack plugin, which I’ve done, so I didn’t lose any of the benefits I had before, but I gained so much more control! There are lots of hosting sites out there, and again, it’s all about what works for you. Your opinion is what counts! I chose to host with Siteground, which I’ll talk about a little more, but I’ve been super impressed with their service so far. It took about 24 hours for my whole switch to happen, but it was well worth the wait. It’s definitely a kind of complicated process compared to how easy everything is with WordPress.com, so I wanted to share my advice from the experience! Your host should do just that, host Think about the word “host” in the common meaning of the term… You’re not hosting this party, they are. A party host wouldn’t just open the door to let you in and leave you to fend for yourself; they’d show you where the food is and make sure you find people you know. In the same way, your site host should be there to help you, and not just leave you to figure everything out on your own. The good things I heard about Siteground’s excellent, 24/7 customer service were a big selling point for me. I spent a long time talking to these guys on their chat on the day of my switch, and they were always so patient and helpful. Free site transfer is a beautiful, beautiful thing. This post isn’t sponsored by Siteground, I’m just very impressed with them. Siteground has free site transfer, so they basically do all the work for you. Once you purchase your plan, they’ll transfer all your old site’s posts and comments and all that jazz to your shiny new site, fo freeee, and leave the fun design stuff for you. Pay attention to your plan. I would’ve chosen Bluehost otherwise, but I wasn’t impressed with how much their prices changed between their advertised and actual prices… Bluehost’s prices drop per month as your plan length increases, but I wasn’t sure about signing up for more than a year without being sure I liked the host. Siteground’s monthly rate is the same whether you sign up for one month, or 36 months, and that was my ultimate selling point. I chose the one-year plan so that if I’m not happy, I won’t be stuck for the next three years. Hopefully I’ll continue to like them, and I’ll be able to stick with them. Patience is the most important tool. I was expecting my transfer to take a few hours. I thought I’d pay for my plan and then immediately be able to work my little fingers off until I had the whole site moved over. That was most definitely not the case. After I purchased the plan, I had to wait a few hours for Siteground to transfer all my stuff from WordPress, (but I’d happily wait to not have to do it myself!). Then, it was a long, difficult wait after I switched my DNS to point to Siteground instead of WordPress. This was a tough one for me, because the site previews wouldn’t load on my computer properly while I waited… but, I woke up to my brand-new site, and it was all smooth sailing from there. Ask, and you shall receive. I probably annoyed the heck out of my Siteground support chat peeps that day, but again, I’m paying for the service, so I’m going to use it. I had a lot of questions and a lot of them felt stupid, but the only questions you’ll regret are the ones you don’t ask. There’s a lot of technical steps in creating your new site, so it’s important that you know what you’re supposed to be doing. New look, new you. This week, I chopped my hair and redesigned my whole site. The switch to your new site is the perfect time to change up your design, content, and logo for a fresh, updated look. While I was waiting for my site transfer, I found the theme I wanted to use and redesigned my site logos and color scheme. Don’t be afraid to change it up! CSS = Cascading Style Sheets, orrrr Cool Site Stuff! I have some basic knowledge of HTML, which was super helpful for the nitty-gritty design of my theme. You don’t have to add to your site’s CSS, but you can if you want to, which is a benefit of self-hosting. I spent some time figuring out some basic code to be able to change the colors and layout of my theme to get all the pretty pink colors you see! If CSS, HTML, and color codes all sound like computer-talk to you, don’t worry about it! But, Google can teach you what you need to know to achieve some basic design. If you’re serious about blogging, let your site reflect that.com plans work just fine, and they make it all so easy! If you’re looking to step up your game and grow beyond the constraints of their basic plans, self-hosted might be the way to go. Big risks = bigger payoffs. Not gonna lie, it’s kinda scary to give up your pretty little WordPress site in exchange for the great-wide-unknown of a self-hosted blog. I had some second thoughts as I sat around waiting hours for my site to transfer… but I had legit butterflies when I saw the whole thing up and working again, even better than ever. Honestly, I couldn’t even tell you all the tech-y things behind what really happens in the switch to a self-hosted site, which is why I’d highly recommend letting Siteground help you out and do the heavy lifting for you. If you’re considering switching to self-hosted, I’d keep doing your research until you find a site that makes you feel as comfortable as possible for the big switch. It is scary, but it’s worth it. Feel free to leave any questions about self-hosted below, or you can always shoot me an email or a message on Instagram, and I’d love to chat with ya! Thanks so much friend!! I’m glad you went self-hosted, too! YOU GO GIRL! First off, I’m so honored you consider me one of your favorite bloggers. That means the world to me! Thankyouthankyouthankyou! Second, YAY FOR SELF HOSTED!!!!! This is a huge step in the right direction for ya. You’re on a ROLL!!! Thank you, Erica!! It’s great to have wonderful bloggers like you to look up to and be inspired by! This was so refreshing to read! I too made the switch to self-hosted about a month ago. Siteground was a little confusing to navigate at first but like you said it is well worth it to have total control over your website. Keep it up!